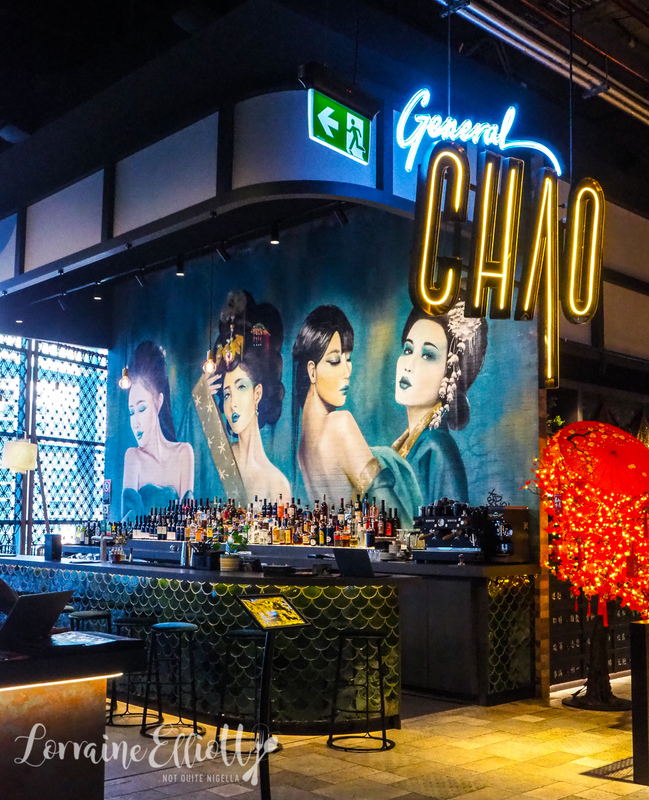 General Chao is the newest Chinese restaurant to open in Chatswood. 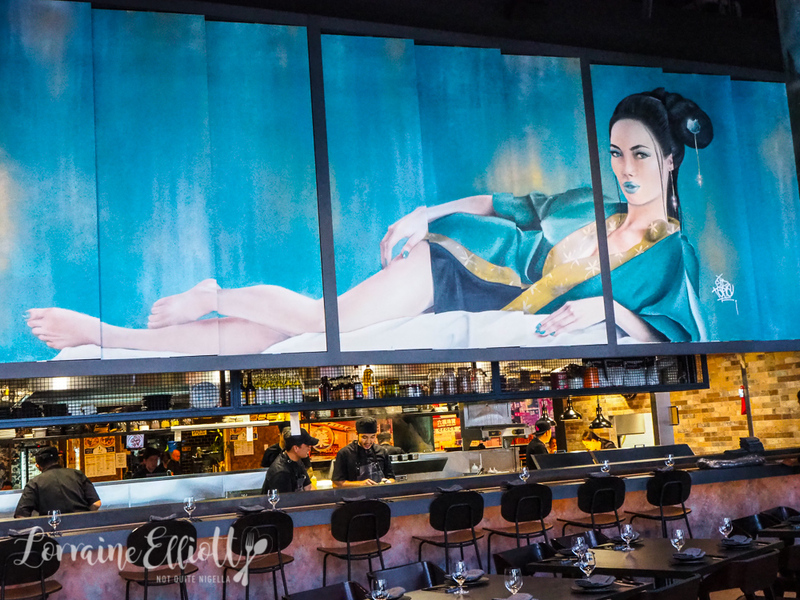 A modern Chinese restaurant with a menu that spans across a few Asian countries, there is a dedicated XO menu featuring 6 types (including one with black truffle and gold leaf). There are also cocktails and a range of tasty bar snacks. Full disclosure Dear Reader, I first came across General Chao when I was invited to eat there for an Instagram campaign. But I ended up loving the food so much that I thought I'd do a review (and restaurant reviews are never sponsored). General Chao sits literally on top of Chatswood train station and if you look down you can see trains come and go. 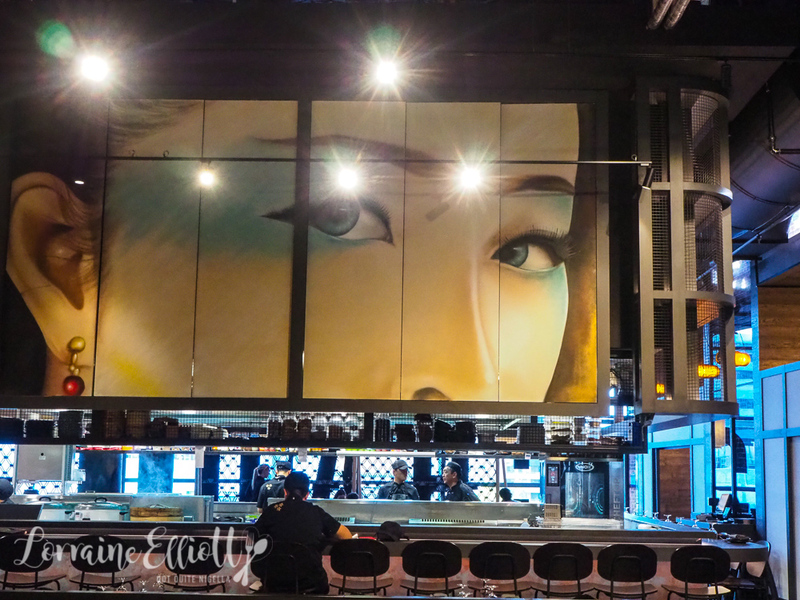 It's part of the District Dining precinct with a range of other eateries. 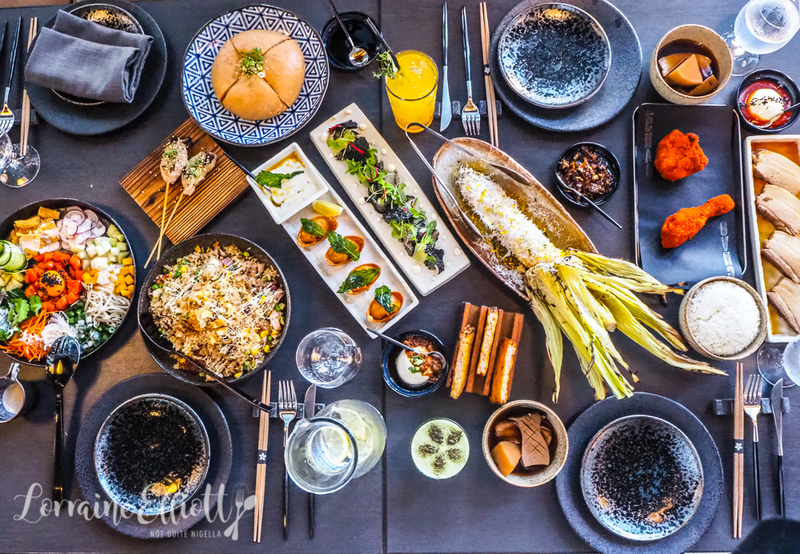 There is a bar with its own range of bar snacks and cocktails designed by Michael Chiem of Sydney bar PS40 as well as a restaurant area. 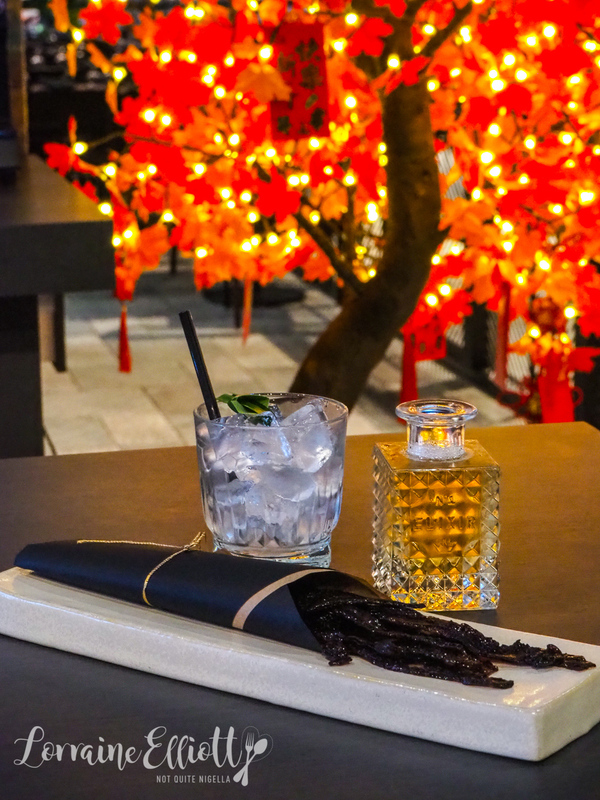 First we try one of the bar snacks- a wagyu jerky that we order alongside a Jean Claude Pandan cocktail. The jerky is made using Jack Creek MBS6+ Wagyu beef marinated in smoked soy and black vinegar and is sweet and moreish and reminds me of bak kwa. The Jean Claude Pandan comes in a little bottle and is a mixture of clarified milk punch, Plantation 3 Star rum, pandan, coconut and pineapple which is rather addictive indeed. We also try two other cocktails-the Buko! is pandan infused Plantation 3 Star rum, house made matcha syrup, lime and egg whites and has a predominant matcha flavour. While the Mandarin Oriental is made with vodka, sherry, mandarin and bitters served over ice with a bouquet garni of thyme, rosemary and sage and is very drinkable (they suggest having this for breakfast). We try the chicken skewers from the grill. 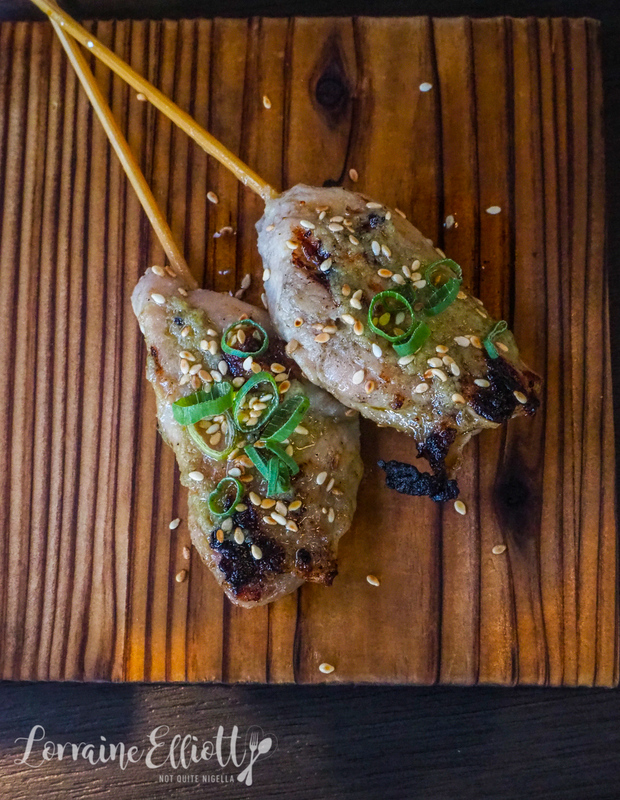 The corn fed chicken is sous vide and basted in Australian unpasteurised miso butter, spring onion and sesame and it melts in the mouth. They did warn us that the chicken might look pink inside but it is cooked through with the sous vide process but ours wasn't pink. I'm a bit of a prawn toast freak that discovered my love for this item later in life. The prawn toast here is one of my favourite items. It is paper thin sourdough slices filled with prawn meat seasoned with ginger, sesame and white pepper. It comes with a spicy XO mayonnaise. I eat two slices without even asking Mr NQN if he wants another cos I'm ruthless that way. 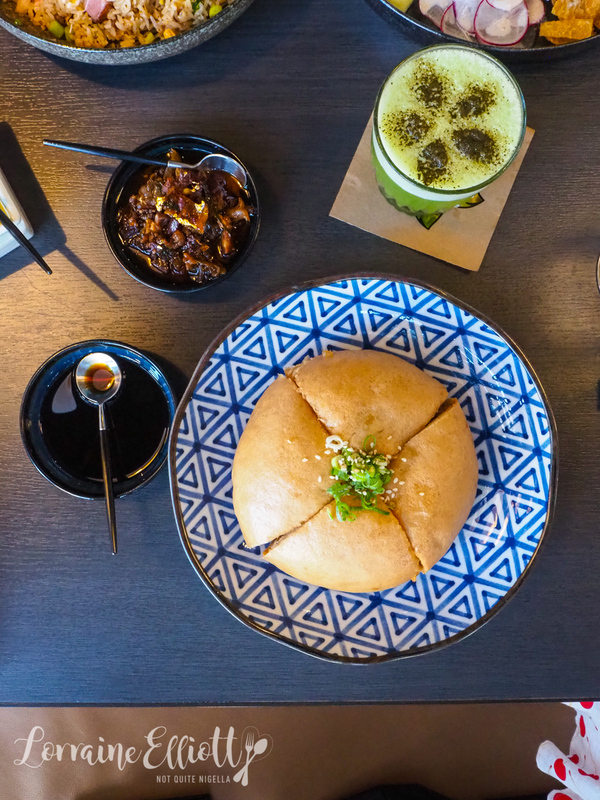 "Is the giant pork bun giant giant?" I asked our waitress and she nods her head eagerly. And it really is. 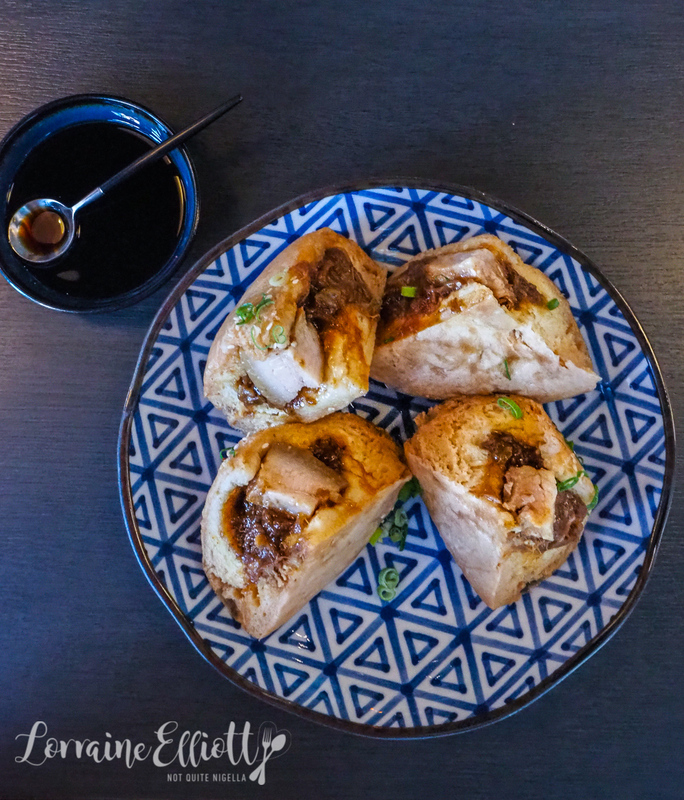 Sometimes bbq pork baos can be a bit too much bread and not enough filling. This one is juuust right (albeit around triple the size of a regular one). There are two types of pork inside it, a soft pulled pork style of pork as well as four cubes of braised free range pork belly as well as chestnuts and mustard greens. It comes with a side of smoked black vinegar that lifts it perfectly. 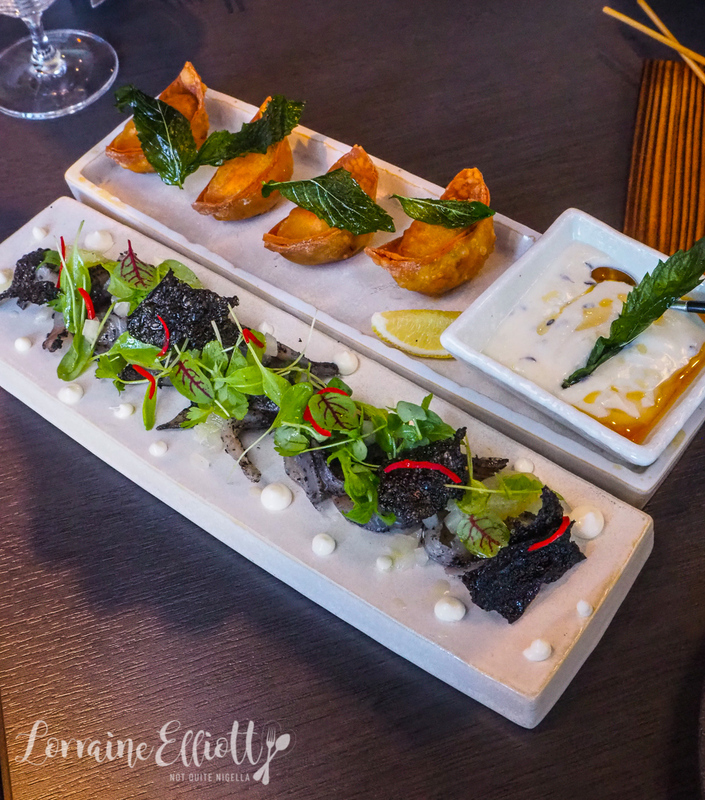 We both found the cured and smoked kingfish pleasant with black sesame paste, black sesame crackers, a herb salad and pickled radish and dabs of yuzu mayonnaise. But there was something that was missing in this and it felt a bit muted especially after the strong flavours in the other dishes. We also tried the lamb won tons that are deep fried and the spices remind me of Uighur dumplings with the aroma of cumin and there's some crunch from the pine nuts too. On the side is a lemon yogurt sauce. Yee Sang is a traditional Chinese New Year dish with sashimi grade salmon and eight seasonal shredded vegetables and fruit. 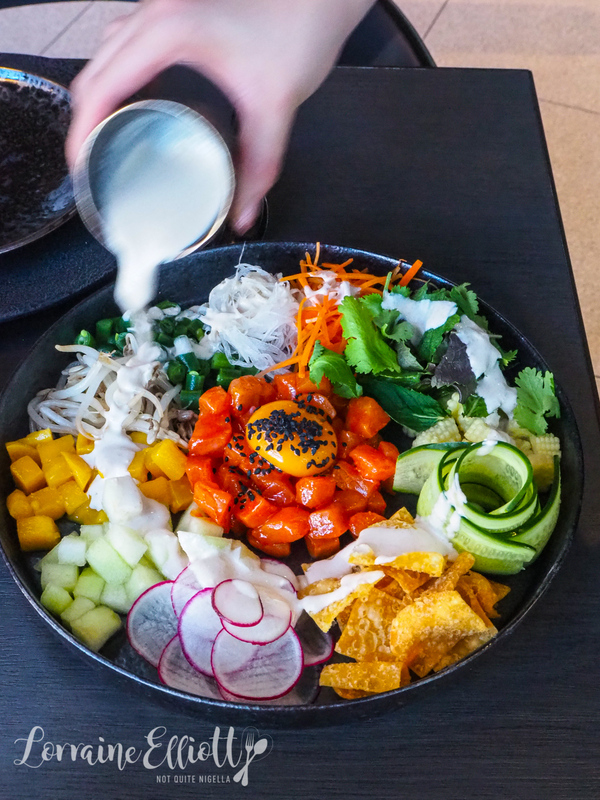 There's mango, pickles and crispy wonton skin for crunch and it comes with a small pot of roasted sesame dressing. You are meant to toss it all together with chopsticks and the higher the toss the better (and bigger the mess for me). Mr NQN is a big fan of this because he loves fresh flavours but I have other fish or chicken to fry. 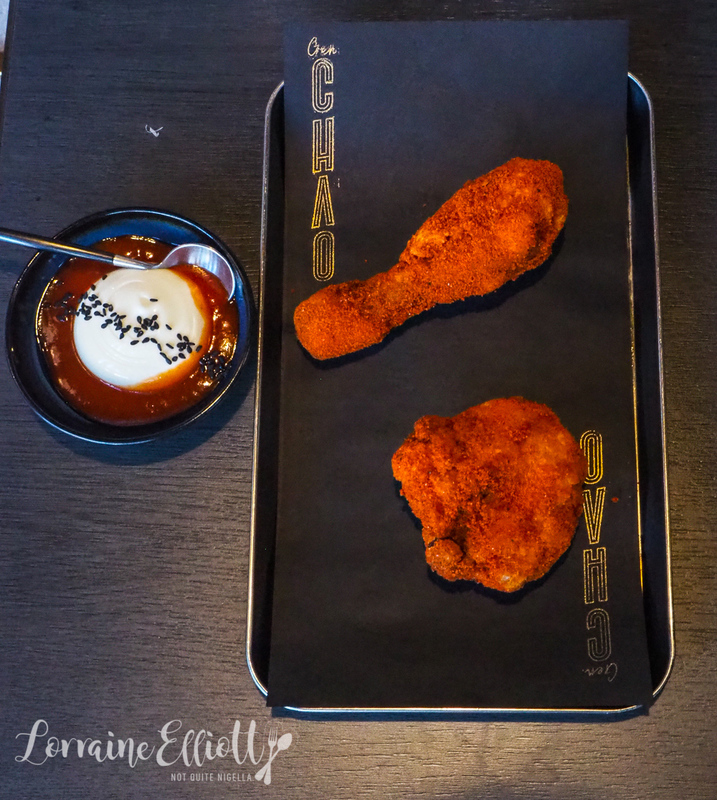 The fried chicken comes two pieces to a serve and the chicken is kimchi buttermilk marinated and then coated in spiced flour and deep fried. It comes with house fermented Sriracha which is smooth and less metallic than Sriracha can be. It's meltingly soft in the inside and crunchy on the outside and I really like the dipping sauce too. And although Mr NQN dislikes fried chicken (he refuses to go on a fried chicken challenge with me), he says that this is his favourite item of dinner. He never fails to surprise. 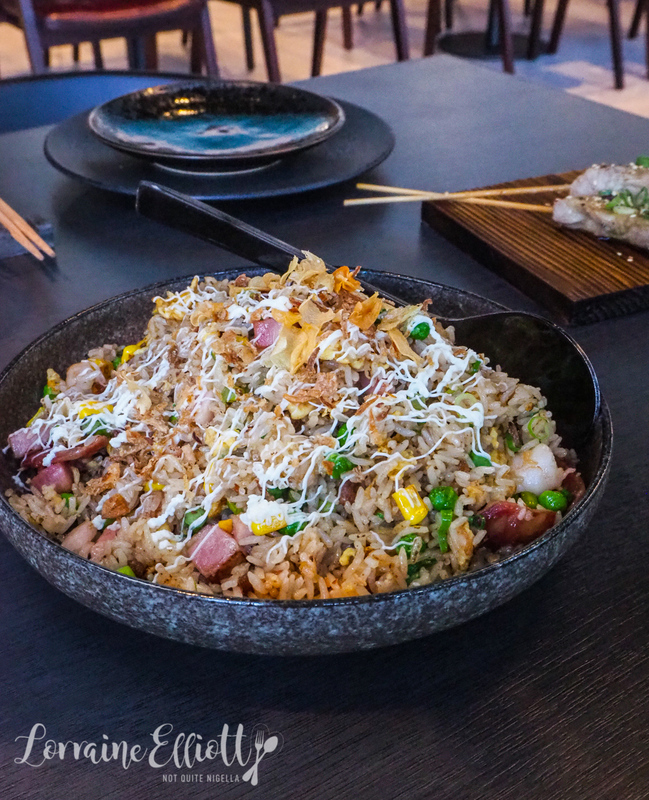 Normally I can take or leave fried rice as it fills me up quickly but I keep going back for more of the special fried rice (there's a vegetarian version and a regular version). This one has AAA grade rice, bacon, lup cheong, prawns, corn, shallots, egg and comes with their classic XO sauce. There's a generous amount of lup cheong and prawns which is why I like it so much. "I didn't get any prawns," Mr NQN says protesting. "Oh really? I wonder who ate them?" I answer. I didn't mind the charred corn but I think I preferred the Chinese dishes over the fusion ones. 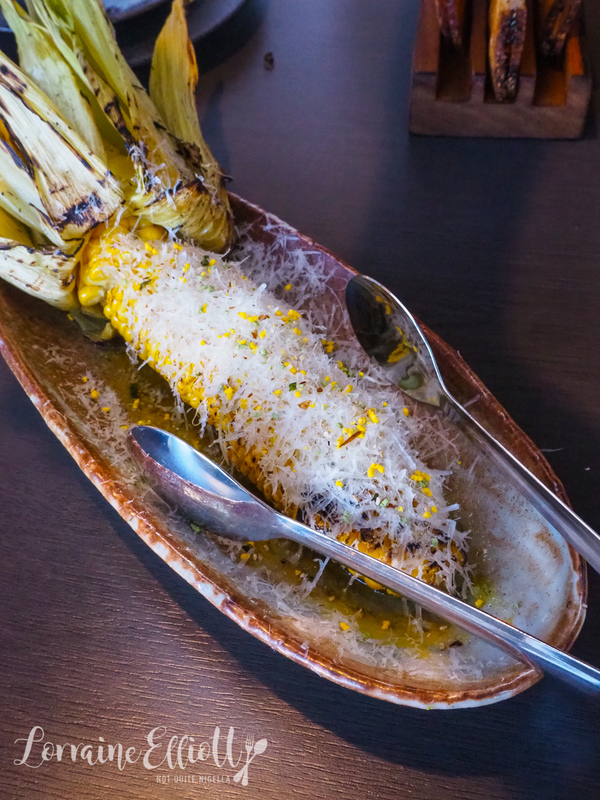 A single corn cob is covered in seaweed butter, sesame and Parmigiano‑Reggiano. It is then sliced up into four pieces for easier eating. There are some share or more substantial mains (eg. tomahawak steak) but we try the 24 hour braised pork belly which is served table side. 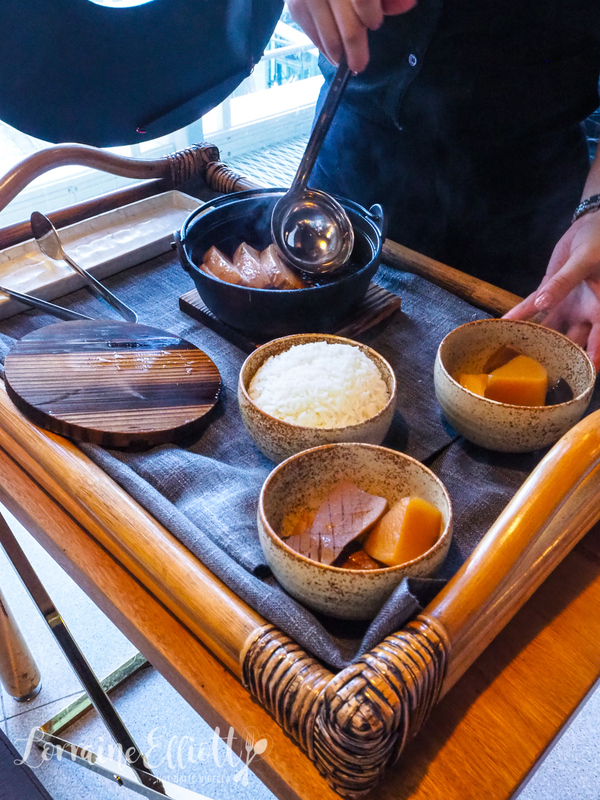 They bring a pot of the pork belly and serve it in two bowls along with steamed rice. 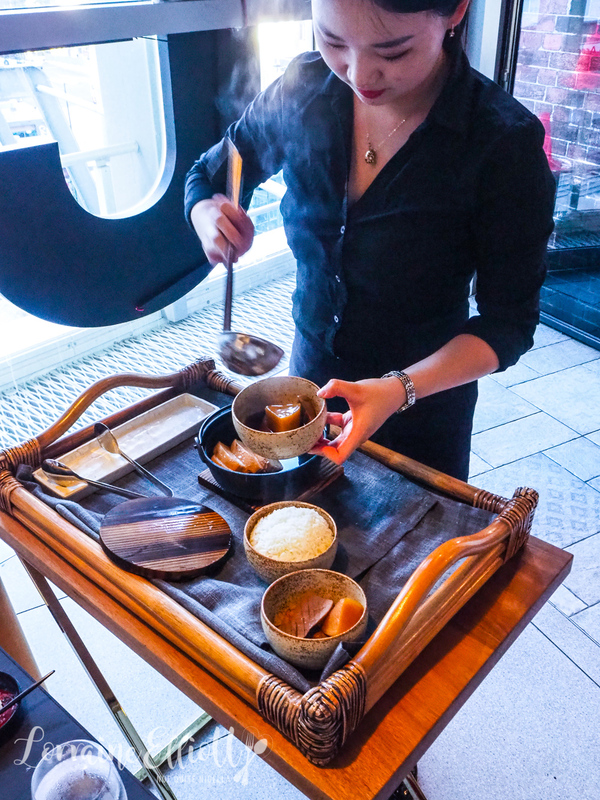 There is braised king mushroom and radish served in the light master stock broth. The pork is soft and melts in the mouth. Oh I saved the XO til last. 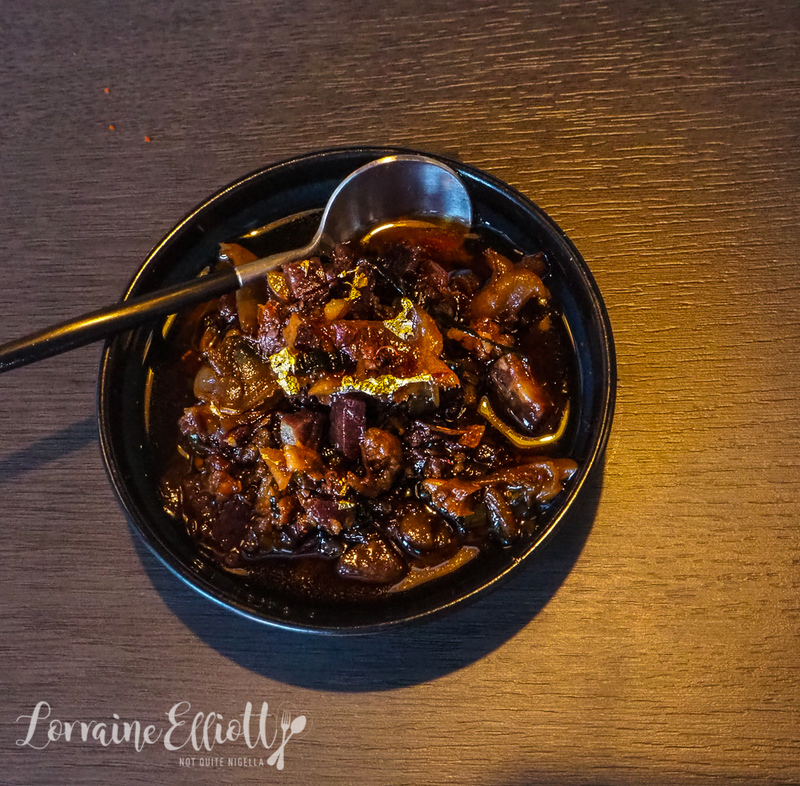 There are six types of XO sauce and I'm adore the stuff (I've also made my own XO sauce too). I am always eager to try other versions that have a slightly different take. XO sauce is usually quite expensive to make at home because the ingredients themselves are expensive. The XO sauces here range from $8 (per 50g/1.7pz. serve) to $30 for the super premium AAA grade Western XO with black truffle, Tasmanian green lip abalone, premium dried scallop, dried shrimp, ginger, garlic, chilli, saffron, Gran Reserva Spanish Jamon and to finish, gold leaf. The flavour of the black truffle is definitely there and it's delicious, especially with just plain boiled rice. I did get to try all of the XO sauces and even the classic (and least expensive one) is delicious and I liked that and the Spicy XO. 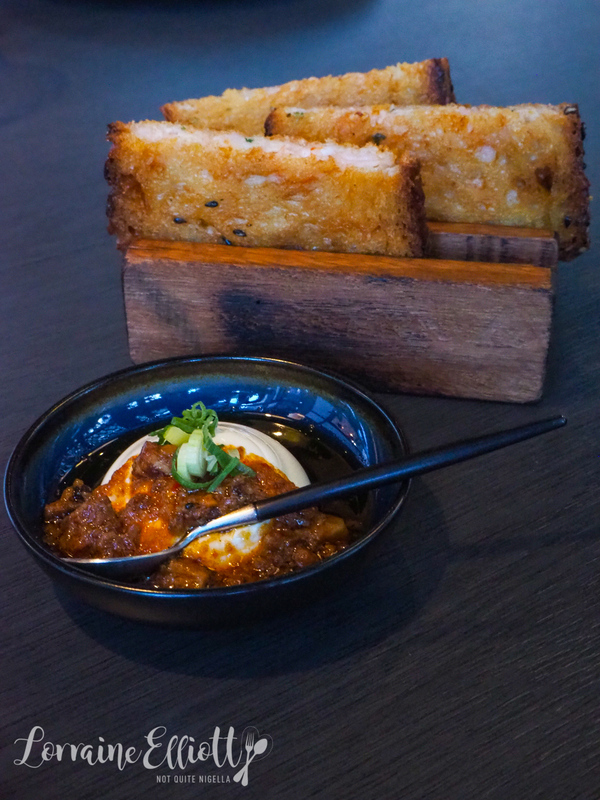 And they let us in on a little secret-the vegetarian XO sauce has Vegemite as an ingredient! I don't usually order the ice cream selection but they did sound very interesting. We tried the strawberry, shiso and sancho pepper which is complex with the strawberry taking a back seat to the shiso and sancho pepper. 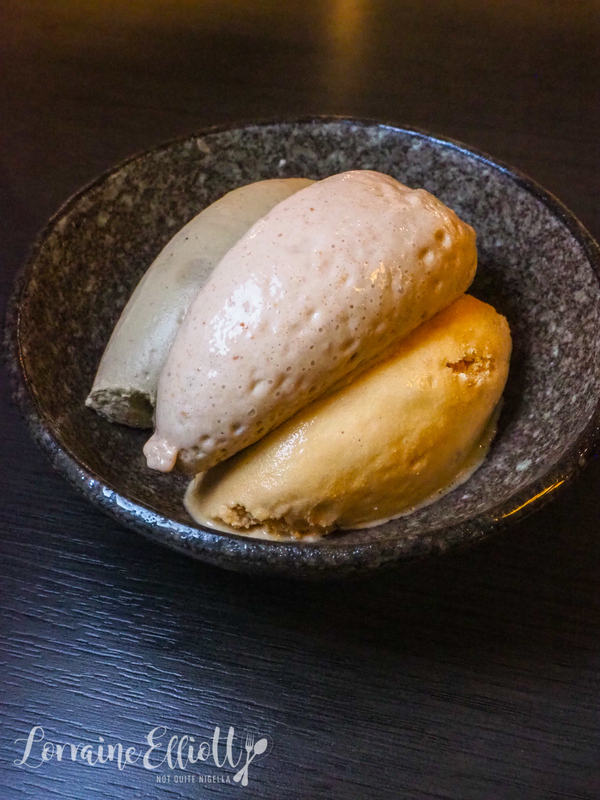 We also tried the overripe banana, miso and peanut which is strong in miso and I think I'd rather it be strong in banana or peanut. Out of the three I like the sweet soy with a little hit of soy sauce at the end but a good caramel flavour at the beginning but the two others perhaps needed a bit of refining. This dessert sounds crazy and perhaps it's not for everyone. But if you like slightly out there combinations this really does taste like Thai green curry. It's a salted coconut rice pudding with roasted rice, mango, chilli and Thai green curry ice‑cream. The ice cream dominates and the roasted rice gives it a slightly dry texture but Mr NQN is a big fan of this. 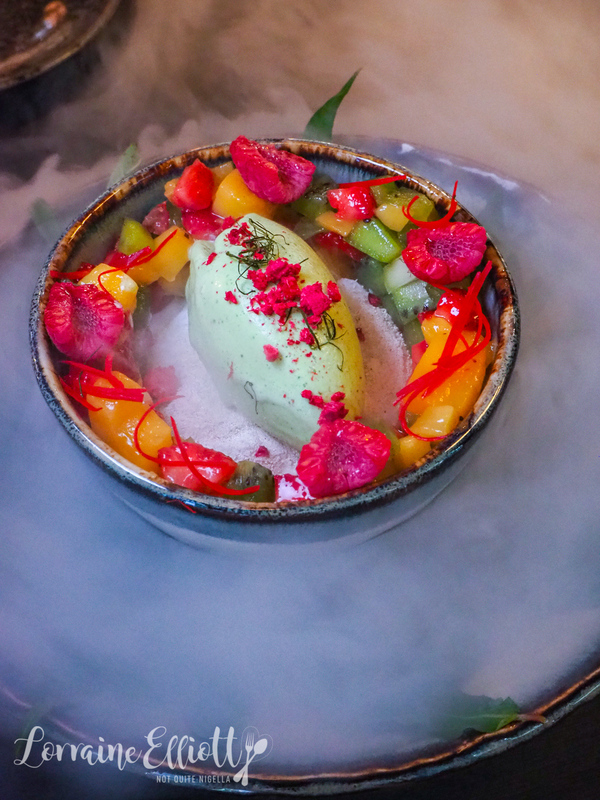 They bring it out in all of its dry ice glory and I like it once I get a bit of everything in it with the fresh summer fruit. So tell me Dear Reader, do you go for unusual flavour combinations or do you stick with classics? And are you a fan of XO sauce? NQN and Mr NQN were guests of General Chao but all opinions remain her own. restaurant20 Dishes & 2 Hours Eating The Menu at Tim Ho Wan, Chatswood! restaurant 20 Dishes & 2 Hours Eating The Menu at Tim Ho Wan, Chatswood!